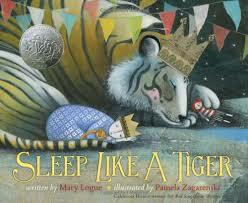 Sleep Like a Tiger by Mary Logue. A lovely bedtime story about a not-at-all sleepy child who finally discovers, thanks to her understanding parents, that she is ready to sleep, warm and strong, just like a tiger. Ages: Suitable up to 6 years of age. Audio Readaloud. Press arrow to play.